It's funny, this little thing is so small, but it carries so much weight and history. I found this game piece (I'm not sure what game it's from) when I was having intense feelings for a close friend of mine. 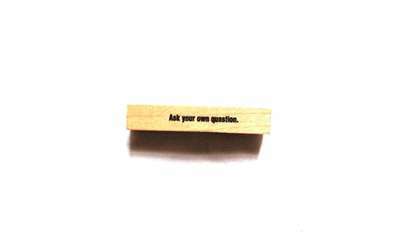 "Ask your own question" seemed fitting for our relationship at the time. We were both in transitional phases and question marks were everywhere. We fell in love, but eventually the fear and unknowns ripped us apart as they usually rip me apart. Method of release - SRS released the associations of this game piece by setting up a game of travel around the world. All were winners and questions were answered.